Are you following our social media? If not, you’re missing out! 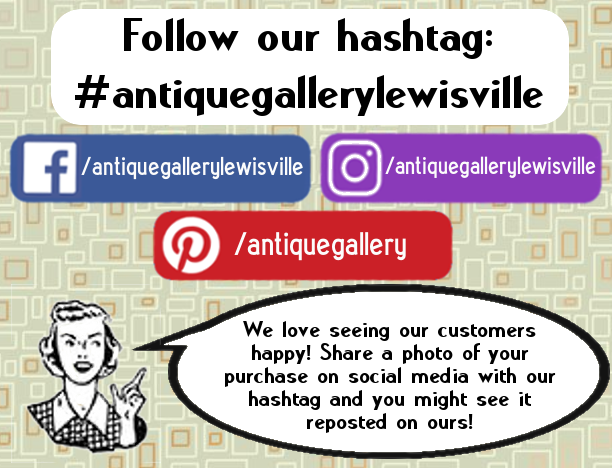 The Antique Gallery of Lewisville posts daily to Facebook and Instagram as well as catalogs trending items on Pinterest. Our social media is the best way to know what we have in our ever-changing stock. It also tells you when new dealers come in and when current dealers are having sales! If you’re not following us, then you’re depriving yourself of great vintage and antique items. Check out our Facebook, Instagram and Pinterest today!